Both of these dishes, in their most simple form, only require a few ingredients. Two of my pantry/fridge staples, which may be new ones for you, are Nori sheets and Miso paste. These are two ingredients that can be expensive, but truly are a great value in the long run. If you spend $20 now, you’ll have the base for at least 10 health meals – the miso goes even farther because all you need is a tablespoon full at the time. AND it’s a whole food pro-biotic. Making sushi is so easy – if you’re not too set on dong it the ‘right’ way. All you need is a grain and some nori sheets. Nori sheets last a long time in the pantry. You might have found that out the hard way – realizing that you do have some in there…but maybe they have been there for 6 months plus because you haven’t had energy to throw that sushi making party yet. It doesn’t have to be that big of a deal. They’re actually very simple to utilize, if you have a couple of staple recipes to throw them in. – again, being miso soup and simple maki rolls. Recipe for the Sweet Potato Biscuit can be found if you click the pic above. Boil water in a tea pot, or pot on the stove top. While this is boiling, cube some tofu and chop your scallion. Grab your favorite bowl and place the scallion, tofu and greens in there. Pour hot water over these ingredients, to just about fill your bowl. Add the nori (I like to add it piece by piece to see it wilt) and stir in your spoon full of miso paste. Stir slowly and gently, allowing the hot hot water to wilt the vegetables, warm the tofu, and dissipate the miso. I love this as a quick breakfast, or light dinner. 1/2 c cooked quinoa – make more and save it for later. Cook the quinoa, covered over med-low heat. It take about 20 minutes, and the ratio is just over 1 part seed to 2 parts water. You can do this with leftover quinoa, but half the reason these are so satisfying is because they are warm. Lay the nori sheet on a large plate or cutting board, shiny side up. Spread the warm, fluffy quinoa over 3/4 of the nori sheet, all the way to the edge (except for the far edge and 1/4 of the sheet that you are leaving empty – see pic.) On the edge closest to you, lay the thinly sliced carrot or scallion, and begin to roll it gently, away from you. 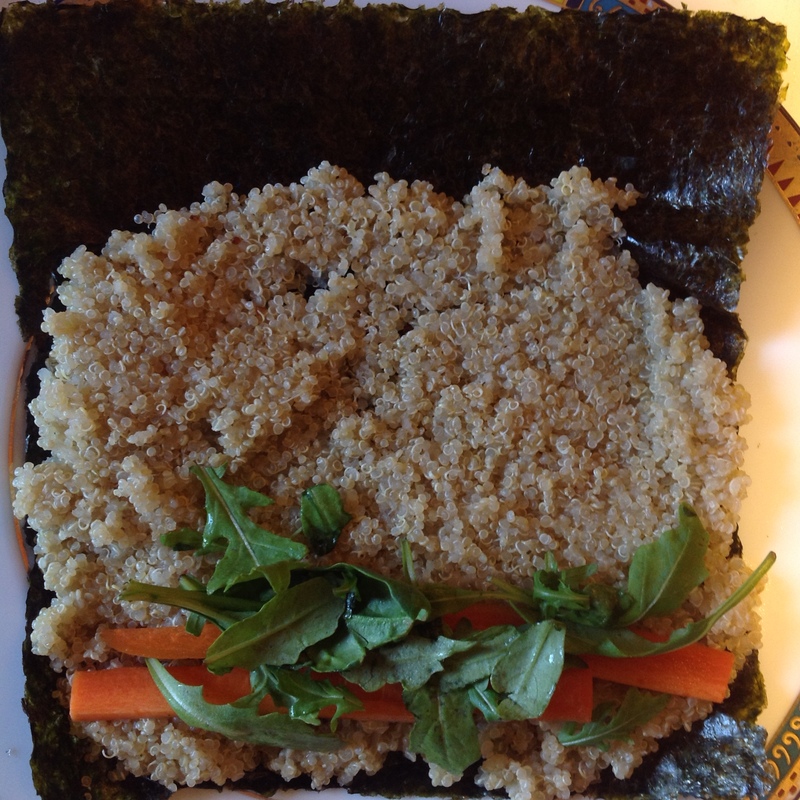 The open part of the nori sheet acts sort of like glue, when the warm quinoa sticks it all together. 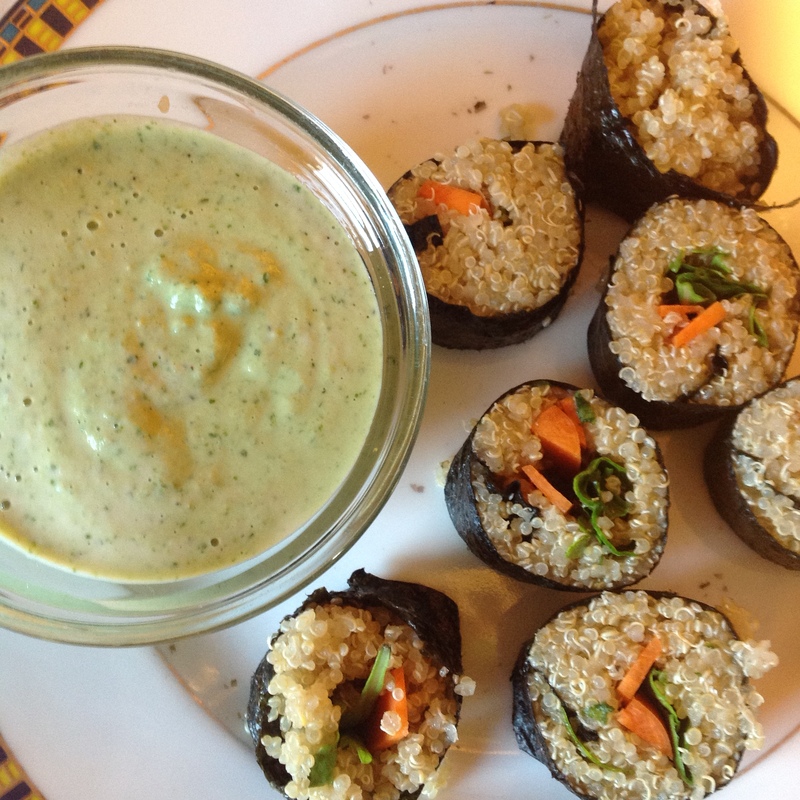 Serve with tamari for dipping, and/or the cashew cream sauce below. Add all ingredients to a blender, and puree. You’ll see that my sauce was green because I decided to add cilantro. Optional, of course. Keeps in the fridge for a day or two. 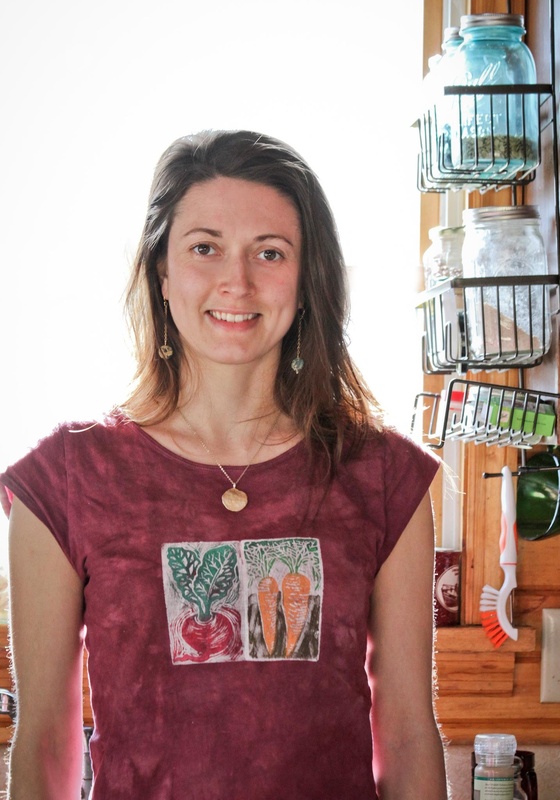 Use on zucchini ribbons for a raw ‘pasta’ or on actual pasta with other veggies – warm or cold. These recipes and others like them are in my Healing Diet Recipe Guides – coming soon!